Marlon Brando in The Wild One (1953), directed by Laslo Benedek, Columbia Pictures Corporation. Motorcycle riders love leather. You see it in movies, TV shows and advertisements. Even those who don’t ride, aspire to achieve the look by wearing leather “moto” jackets and boots. 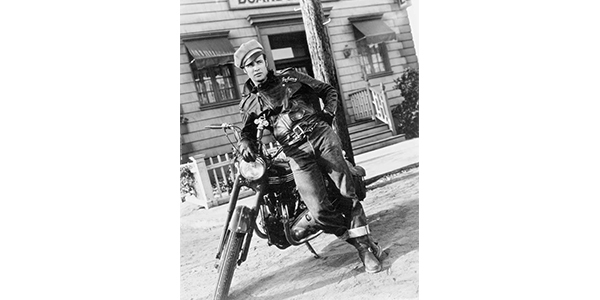 The most memorable association of motorcycle riders and leather jackets stemmed from Marlon Brando’s character Johnny in the 1953 movie, The Wild One. Watching him dismount his motorcycle, clad in a sleek black jacket made everyone of the era envy him. But Brando had ample reason to choose leather over other textiles. It was not only stylish, but extremely functional. If your customers want to hone a theatrical look while on their motorcycle, make sure they’re looking at a jacket that is designed for riding. Fashion leather jackets and motorcycle jackets are not the same, starting most noticeably with the fit. Motorcycle jackets are designed to fit the shape of the rider in the riding position. Sleeves will be longer on the rider’s back and pre-curved in the arms as to not create resistance against the shoulders. Leather jackets designed for fashion are made to be worn in a relaxed position and will pull and leave areas of the body vulnerable to potential dangers. A leather jacket provides optimum protection for the rider’s arms and upper body in the event of a crash. Cowhide leather is the most common with a great combination of abrasion resistance, durability and flexibility. The thickness of the leather will vary between brands and levels of quality, and for fashion it’s one thing, when it’s between the rider and the road, it’s another. For hotter weather, perforated leather offers additional cooling with very minimal loss of protection. Layering also helps increase protection with the addition of armor in specialized areas of the jacket, including the shoulders, elbows and back. If a rider is looking to wear their jacket out on the town, most jackets offer the ability to remove armor to make the jacket more comfortable after the ride. An important tip to leave your customers with is this: you get what you pay for. Show your customers the stitching in the leather products that you offer. When you attempt to pull at the stitching, notice that it won’t budge. Have the customer try that with the leather sold at a major department store; big difference. Remind your customers to invest in their safety, and while doing so, they can still look as cool as Johnny.